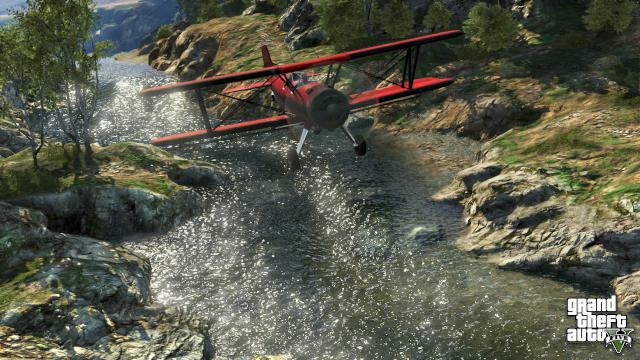 When GTA V came out much was made of the online component. 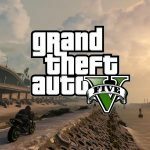 The single player has been well documented – I thought it was excellent, even the gunplay wasn’t bad and this is coming from someone who, whilst enjoying the GTA series is of the opinion that the shooting is the weakest part. But online was the big question mark, GTA4 had a go at it, but GTA V was supposed to really nail it. On Xbox 360 it was… a bit pants. The idea was good, but server issues plagued it, there wasn’t really much to do other than PvP organised shoot outs or races assuming you didn’t get kicked. You could buy a house and invite your mates round. And the much lauded ‘heists’ were nowhere to be seen for years. Recently I decided to give it another go, but this time on the new generation of machines. My console of choice is the PS4 and straight away I was amazed that I could import my character from Xbox 360 using my Rockstar login. It was really easy too, all of the stats carried over and I remembered what I had made my character looking like, exactly how I left him. I had the chance to change his features but why mess with perfection? He was perfect as he was. Loading up back into the world of GTA V was strange. Nostalgic yes, but the switch of generations meant not only did it look familiar – it looked better. Usually when you go back to games you’ve played before they look worse so it was a nice surprise that things are the other way round here. What struck me as I began to explore and get stuck in is that there is now an awful lot to do. I wandered around some shops – the amount of clothing and styling options have greatly increased since launch. Rather sadly I spent a good hour buying clothes and customising my look – helped by a handy wad of cash afforded to me from Rockstar (whether it’s a welcome back or upgrading to a new version package I’m unsure). I had a browse on the internet, bought a nice new car and thought about upgrading my house. Then I got mugged. As you play in the MMO-esque world, it becomes apparent that Rockstar have this living, breathing world being fuelled by the deeds of other players. Another player on the server had sent someone to rob me. I chased the NPC down and shot him. Money returned. Only to have the organiser come for me. I wasn’t ready, I died. As you cause mischief in the world be it against NPCs or other players, your reputation changes. From a white circle on the map you become redder – showing other folks in the game world that you’re not to be trusted possibly. You can get this down by ‘playing by the rules’ – by doing jobs and not griefing others. As a fellow player drives past me, chased by police and helicopters, my phone rang. Can I help out take out a rival gang and return some drugs for someone? Sure thing. I accept and am paired with other players who also took part. We drive to a water overflow section where this gang is held up for a meet, surround them and begin to dismantle them member by member. I collected the package and jumped in a car with my buddies as we had to fight across town to bring it home. Post mission we were all dropped together. I worried that it could all get out of hand, and sure enough one player went insane and shot another in the face. I was caught in the crossfire and died. When I came back to GTA Online, I had left my car in the open world and it had been impounded. You get the feeling that this world continues while you’re not there, so I had to go and break into the compound to retrieve it. On the way back I stopped by to rob a newsagents. Helpfully I had a mask which I put on so I wouldn’t be recognised the next time I need to stop by for a snack. With my wealth topped up, I went online and bought a high end apartment. Heist time. 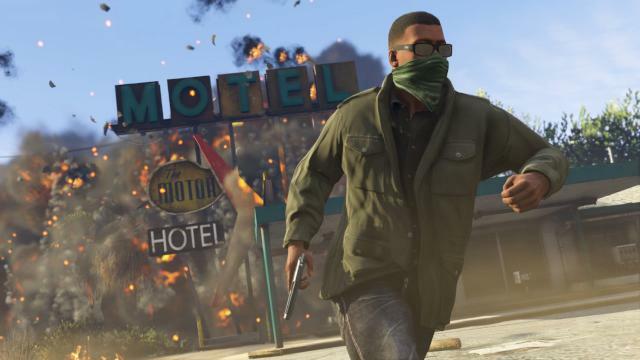 Heists are the big appeal for GTA Online. Woven into your time in the world is a backstory of you making it as a new criminal heavy. Lester pops up frequently and introduces you to the heists (once you reach level 12). The first heist acts as an intro and you’re partnered with just one other human player. It involves driving to a location, scouting a bank (with a mini game for the passenger) and then getting the gear to rob it – one person on the drill (another mini game) and one watching the hostages (presumably a mini game, I was the driller). Then it’s time to escape. The heist was brilliant, it felt really well played out with interesting roles for each players. Later heists are even better and more involved – one involves you raiding a biker gang, approaching by boat and night and taking them out with stealth and silenced weapons, avoiding vision cones. This is a heist set up mission – a number of these are involved to prepare you before starting the actual event. Another setup involved infiltrating a police station to get some plans, and another is taking out a witness in a mountain-top hideout. As the leader of the heist you pay for the setup costs whereas your buddies just get paid. Yet the main event comes and you can decide the cut – with the organiser getting the lion’s share since they have already paid the setup costs. On my first go joining someone’s heist I felt a bit let down getting only 5% due to being the driver. Thankfully the rest of the team were very good and secured the full haul so that 5% helped fund my next heist. The main events are varied – without spoiling too much they do a good job of being different and feeling spectacular, with each of the four players having enough to do that they feel like they’re playing an integral part and not just tagging along. I keep going back to GTA Online as there are constantly new things to discover. The usual PvP events are still here but with more modes and options now – one game has a team as the cops and a team of runners trying to get across the town for instance. There are nice tweaks like this on classic modes, but also the ability for users to create and share their own variants. For those that have played GTA V and not ventured online they really should. For anyone who, like me was put off in the first instance should definitely check it out again and experience the heists. A word of warning though, you may need to make sure you have a buddy to partner up with – playing with randoms can result in some frustration as there’s only so many times you can watch your team die by flying into a mountain!